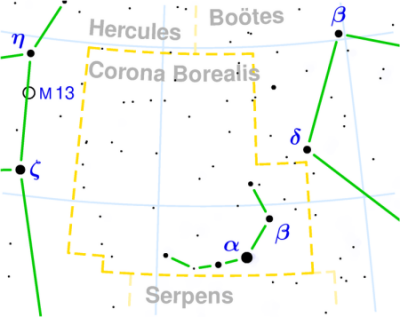 The constellation Corona Borealis is found nearly midway between Arcturus and Vega; a little closer to the first of these stars. 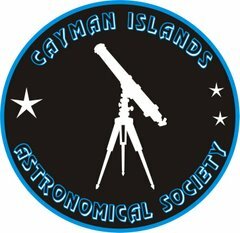 It is characterized by a half-moon shaped line of stars, among which Gemma is conspicuous, similar to a precious stone on the crown (this star is also known with the name of Alphecca), which is a 2.2 magnitude star 75 light years away. 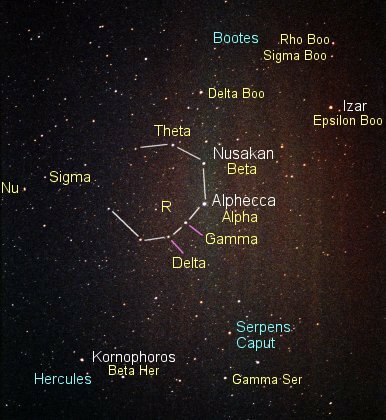 Although faint, the constellation is quite easy to make out. 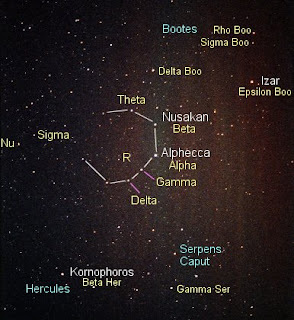 The loop of nine stars from Pi to Rho Coronae Borealis was known in China as Guansuo, the prison for working-class miscreants; the prison for the upper classes was more auspiciously placed farther north, in Ursa Major. 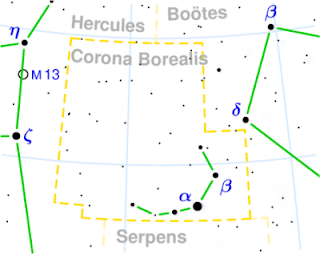 Corona Borealis was sometimes considered to represent a crown that was given by Dionysus to Ariadne, the daughter of Minos of Crete. At other points it was considered to belong, in a sense, to Boötes, the herdsman. The Cheyenne nation of Native Americans called it the "Camp Circle" as they arranged their camps in a semicircle. In Welsh mythology, the Northern Crown was called Caer Arianrhod, ‘the Castle of the Silver Circle,’ and was the heavenly abode of the Lady Arianrhod. Venus, Mars and Saturn are still bright in the sky.